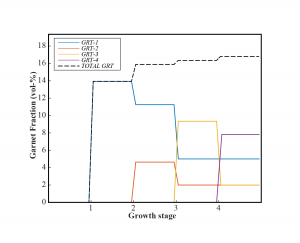 GRTMOD is a MATLAB-based program to model garnet growth and resorption stages in metamorphic rocks. The main routine of GRTMOD uses an inverse approach to fit the garnet compositions predicted by thermodynamic forward models with the one measured by the mean of standardized X-ray maps. The main goal of GRTMOD is to optimize pressure, temperature equilibrium conditions and the local effective bulk composition. The program allows accurate modelling of the successive growth zones of natural garnet. Gibbs free energy minimizations are done with Theriak-Domino, originally using the add-on TheriakD. Software developed and maintained by Dr. Pierre Lanari (University of Bern). *** Nov. 2018 *** If you do not have X-ray maps of garnet, you can use my converter file that generates pseudo X-ray intensities from garnet spot analyses. NOTE: The weighting procedure can significantly affect the results if the weights are not correctly defined (e.g. Fig. 11 in Lanari & Duesterhoeft 2019).